Want to thank Miyon and Tink for their always wonderful words and Risa who left these : "Honestly while my son was growing up there were many occasions I would wish for a reference manual like 'dummies for parents' or something like it. There just isn't anything though that can ever prepare you for what your little 'individual' may do or say, you know? Still okay though, it builds character and keeps our minds and "imagination" active - LOL "- I needed that Risa!!! It's late so I'll just post this layout and share with you the template. The white doodled frames were drawn and scanned in, but I think they were too small, so the final result if you print this 12X12 might appear a little fuzzy, but if you think it's fine, then enjoy it! I did them because my usual white frames didn't look good on these photos that had quite a bit of white in them. I love your layout and the hand-drawn frames are awesome (wish I had that talent). Thank you for sharing the template of it. Love this... so cute...thank you for sharing. 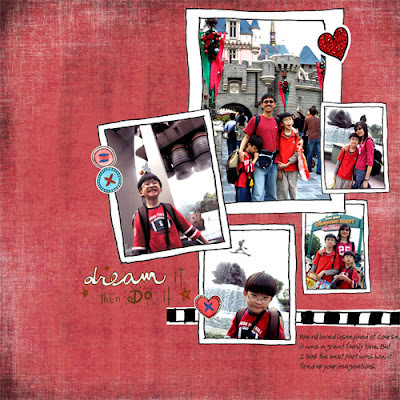 Thanks for sharing the template, your layouts are wonderful too! Danke, gefällt mir richtig gut. Loving these as always - you really make digi scrapping so much easier ! Thank you Yin! I discovered you just as I became a member at GDS and you were leaving as a designer. Luckily you're store was still open a bit longer so that I could grab your amazing kits! I really love your designs and enjoy visiting your blog! Merci beaucoup pour ce beau sketch. Thank you very much for this beautiful template. Love this template.Love reading your blog. Thank you for another lovely template...and special thanks for the 4shared link to template 5...you're such a sweetie for doing that for me!!!! Thanks!!! Just love these fun, modern template! Can't wait to play with it. The hand-drawn look is super! Thanks for sharing. Hi ! I used a part of your lovely template in my last LO, I hope you don't mind if I cut only a little part. BTW I love your templates and your designs !!! Thanks a lot ! Thank you for the template...also the idea...i'm going to scrap my son's visit to Disney with this one! TY!!! I love your whimsical designs - thank you! I like your templates...thank you for sharing!